The Australasian Horror Writers Association is pleased to present the winners of the Australian Shadows Awards from previous years. 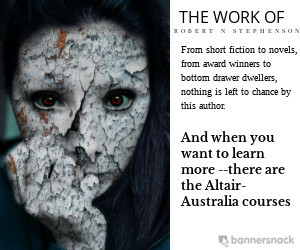 These works represent the very best in horror works produced by Australasian writers in and are the embodiment of those stories that linger long after the final page. Best Collected Work: Perfect Little Stitches and Other Stories, Deborah Sheldon. Best Edited Work: Cthulhu Deep Down Under Volume 1, Steve Proposch, Christopher Sequeira & Bryce Stevens. Best Novel: Corpselight (Verity Fassbinder Book 2), Angela Slatter. Best Written Work in a Comic/Graphic Novel: No Award. The Paul Haines Award for Long Fiction: Ismail’s Expulsion, Brian Craddock. The Rocky Wood Award for Non-Fiction and Criticism: The Body Horror Book, Claire Fitzpatrick. Short Fiction: The Banksia Boys, Matthew J Morrison. Best Collected Work: Singing My Sister Down and Other Stories – Margo Lanagan. Best Edited Work: Midnight Echo #12 – Shane Jiraiya Cummings & Anthony P Ferguson, Below the Stairs – Tales from the Cellar – Steven Dillon. Best Novel: Aletheia – J.S. Breukelaar, Slithers – W.W. Mortensen, Soon – Lois Murphy, Providence Place – Matthew Tait. The Rocky Wood Award for Non-Fiction and Criticism: 101 Weird Writers #46 – Ryūnosuke Akutagawa – Kat Clay, Literary Serial Killer Fiction: The Evolution of a Genre – William Cook, It Follows is the Millennial STD Parable of Our Time – Maria Lewis, A Shared Ambition: Horror Writers in Horror Fiction – Kyla Lee Ward. Short Fiction: Outside a Drifter – Lisa L. Hannett, The Hand Walker – Rue Karney, The Circle Line – Martin Livings, The Little Mermaid, in Passing – Angela Slatter, The Big Reveal – David Stevens. The Paul Haines Award for Long Fiction: Hope and Walker – Andrew Cull, This Impossible Gift – Matthew R Davis, No Good Deed – Angela Slatter, Furtherest – Kaaron Warren, Eden in the End – Ashlee Scheuerman. Best Short Story: His Shining Day – Richard Harland. The Paul Haines Award for Long Fiction: Tipuna Tapu – Dan Rabarts. Best Collected Work: Crow Shine – Alan Baxter. Best Edited Work: Dead of Night – Shane J. Cummings (ed.). Best Novel: The Grief Hole – Kaaron Warren. Best Written Work in a Comic/Graphic Novel: N/A. Rocky Wood Award for Non-Fiction and Criticism: N/A. Short Fiction: D Is for Death – Pete Aldin, Midnight in the Graffiti Tunnel – Terry Dowling, Protege – Anthony Ferguson, His Shining Day – Richard Harland, No Other Men in Mitchell – Rose Hartley, Selfie – Lee Murray, What the Sea Wants – Deb Sheldon, Uncontainable – Helen Stubbs, All Roll Over – Kaaron Warren, Fade to Grey – Janeen Webb. The Paul Haines Award for Long Fiction: Box Of Bones – Jeremy Bates, Served Cold – Alan Baxter, The Eschatologist – Greg Chapman, The Heart of the Mission – Matthew R Davis, Burnt Sugar – Kirstyn McDermott, Tipuna Tapu – Dan Rabarts. Collected Works: Crow Shine – Alan Baxter, Concentration – Jack Dann, Everything Is Fine – Grant Stone. Edited Works: Dead of Night – Shane Jiraiya Cummings (ed. ), Dreaming in the Dark – Jack Dann (ed. ), At the Edge – Dan Rabarts & Lee Murray (eds.). Novels: Hollow House – Greg Chapman, The Devil’s Prayer – Luke Gracias, Presumed Dead – Rick Kennett, The Invasion – Brett McBean, Into the Mist – Lee Murray, Unbidden – TJ Park, Devil Dragon – Deborah Sheldon, The Grief Hole – Kaaron Warren. The Rocky Wood Award for Non-fiction and Criticism: N/A. Short Fiction: The Bone Maiden – Greg Chapman, Eight Seconds – Pandora Hope, El Caballo Muerte – Martin Livings, Perfect Little Stitches – Deborah Sheldon, Mine Intercom – Kaaron Warren. The Paul Haines Award for Long Fiction: In Vaulted Halls Entombed – Alan Baxter, The Haunting of Gillespie House – Darcy Coates, Night Shift – Dirk Flinthart, The Whimper – Robert Hood. Collected Works: The Abandonment of Grace and Everything After – Shane Jiraiya Cummings, Peripheral Visions: The Collected Ghost Stories – Rob Hood, Cherry Crow Children – Deborah Kalin. Edited Works: Bloodlines – Amanda Pillar, Lighthouses – Cameron Trost, Midnight Echo 11 – Kaaron Warren, Blurring the Line – Marty Young. Novels: The Catacombs – Jeremy Bates, The Haunting of Blackwood House – Darcy Coates, The Transgressions Cycle: The Mothers – Mike Jones, The Transgressions Cycle: The Reparation – Mike Jones and Leonie Jones, The Big Smoke – Jason Nahrung. Comics/Graphic Novels: The Road to Golgotha – G.N. Braun & Amanda J Spedding, Troll – Michael Michalandos, The Monster – Ben Rosenthal, Undad – Shane W. Smith.